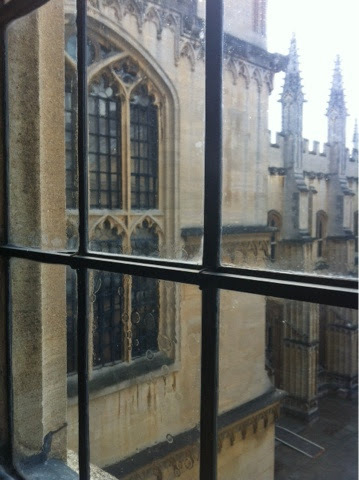 It’s truly impossible to get any work done in the Bodleian upper reading room. 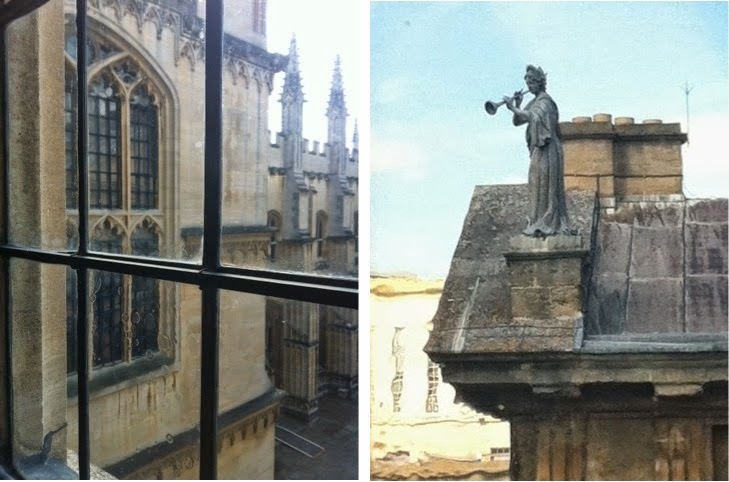 If the books aren’t tempting enough, my god, just look out these windows! The buildings look like little miniature models through the wavy antique glass. It felt like I could reach out and rearrange the buildings to suit my fancy, or play with the sculptures, which would fit in my hand. I took these pictures last week after returning home from my little writer’s retreat to Scarborough. My last paper was on propaganda in the portraiture of Queen Elizabeth I. This time around I checked out books by Galen, Paracelsus, Agrippa, and a book about 16th century German woman healers for my final research paper on 16th and 17th century paper talismans in Austria and Bavaria. 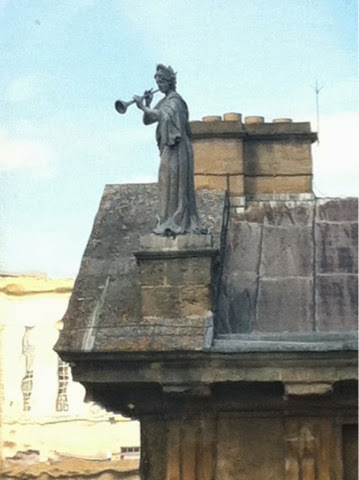 The Clarendon building (below, right) with the woman blowing the horn has good memories for me. There are figures all along the roof, little human spires. A friend and I used to sit on the other side of of the Clarendon building having picnics and watching the shadows of the figures climb up the building on the other side of the road. One of the shadows – a woman- climbed closer and closer to an open window on the facing building, then disappeared inside of it. I was fascinated by her, a kind of Cathy and Heathcliff story played out in shadow. “It’s me, it’s Cathy, let me into your window…” I love watching shadows morph into different shapes and interact with architecture, people, and imaginations. 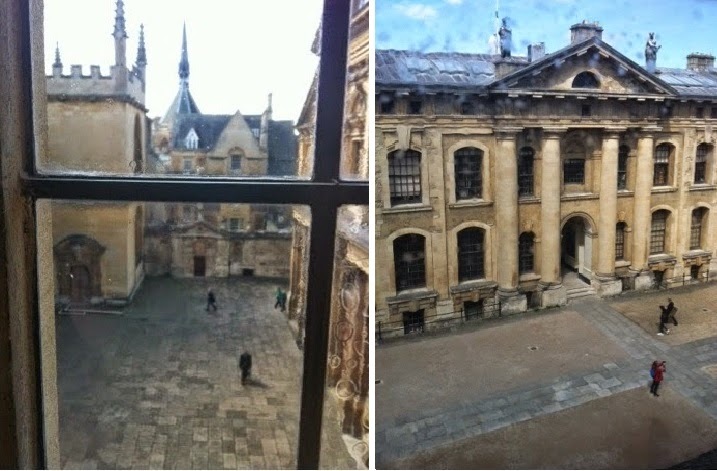 The Sheldonian Theatre is in one of these pictures. 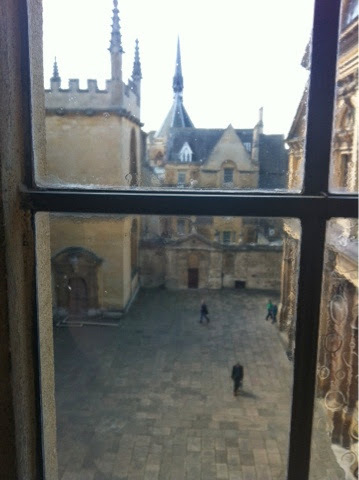 I could see it through the north side of the Reading Room. One night Sean and I were broke, so we sat against the big back door of the Sheldonian and listened to a performance of Russian music. We listened to it through our backs against the rumbling door. It was chilly huddled up in that dark little corner of music so we put on a ballet performance – we had the whole area between the Sheldonian and the Divinity School to ourselves – we twirled and curtsied and swirled and dipped and tumbled and giggled and then ate chocolate cake in a dark alcove as the respectable paying audience poured out of the exhausted building. 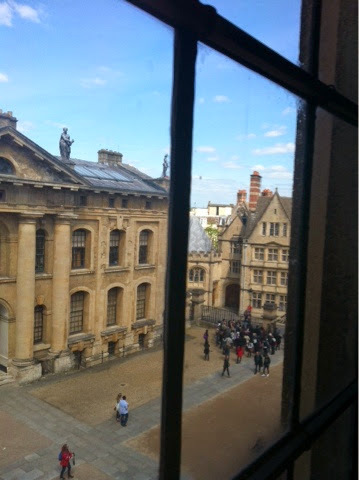 I’d like to make a confessional map of Oxford. Where I’ve kissed, where I’ve left anonymous love letters in stone walls or in drawers in pub tables, which books I never returned to which pubs (but intend to! ), which wier I _______________ on the grass surrounded by a half moon of moored glowing narrowboats, which doorway I sat crying in with a bottle of alcohol hid beneath my coat, where I stood as a homeless man stuck his fingers in my mouth, which tasted of urine. 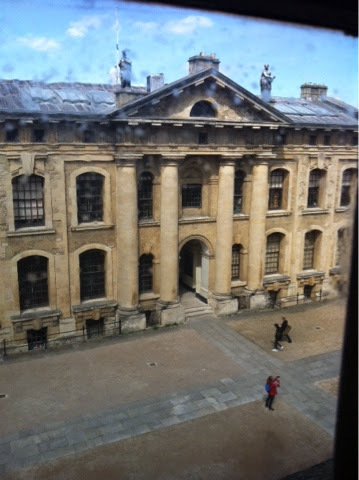 Actually, I could divide Oxford into tastes and smells, pleasures, pains. Sour, savory, sweet. I could include a handy reference of medieval lore, too, like the best spot to cure blindness. First I’ll write an essay with little anecdotes about 50 pubs I’ve been to. Like the one where I hid photos of myself beneath ripped upholstery and gave a certain gentleman clues to find it. Stone libraries, cathedrals, churches – they’re my carapaces. I feel so safe, slow, and hidden within them. They become an extension of my body. I can’t believe I’ll probably be moving away in six months. 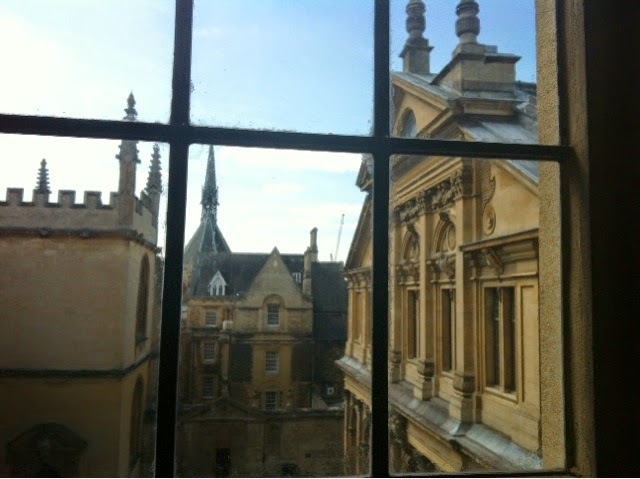 I’ll always return to Oxford – in poems, memory, maybe in other people’s memories, and in person. And my love notes and diary entries are folded up everywhere, hidden all over the city. People will find me again and again, in charity shop pockets, taped to the underside of old phones in red phone booths, in between the pages of books, everywhere. Only a small part of me will really be leaving. Just the body and its bad ballet. 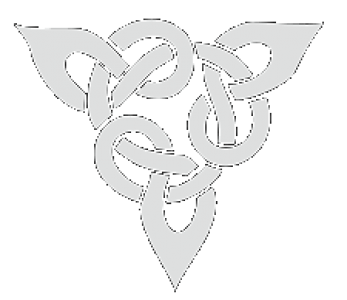 Previous Post "only god can guide us in the fog, which seems to move with us…"